Coffee time: Caroline Grogan at Brisbane’s first Memory Cafe. BRISBANE’S first Memory Café runs to support people with dementia and those who care for them. 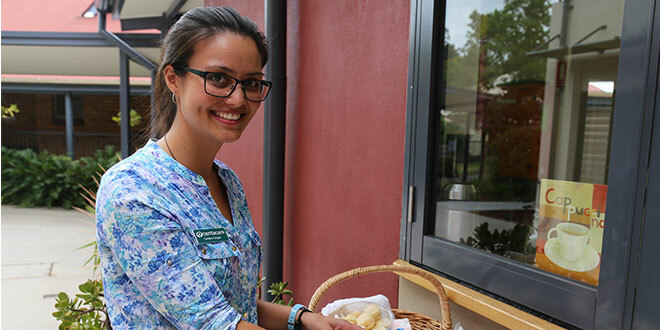 “It’s a relaxing opportunity to share stories and hear solutions from other people, whilst enjoying refreshments,” Centacare’s Caroline Grogan, who co-ordinates a program for carers, said. Ms Grogan said something as simple as a chat over a cuppa, with a slice of cake, and a chance to discuss, learn and exchange information about dealing with dementia can be therapeutic for carers. The café meets bi-monthly at the Churches of Christ Campus in Mitchelton, and there are plans to set up more cafés across the city. The idea was borrowed from the first Alzheimer Café started by Dr Bere Miesen in the Netherlands in 1997. He was frustrated that health and social care students were not taught more about the invisible (emotional) aspects of living with dementia, including fear, anger, helplessness, stress and grieving. There are now 200 cafes operating in the Netherlands and dozens more worldwide. “So we thought we’d replicate that here in Brisbane,” Ms Grogan said. After recently completing a Masters of Social Work from QUT, Ms Grogan is part of a team working to deliver a wider strategy of dementia-friendly communities that can best provide services and care, including flexible and appropriate respite for carers. “It’s very important. Because otherwise their relationship with the person they care for can come under a lot of strain and tension,” she said. Ms Grogan said, working from Centacare’s Enoggera Centre, she was witnessing many more cases of younger onset dementia. “They could be in their 40s, 50s and they are getting the diagnosis and having to leave work earlier than expected – both for themselves and their family – so the family is not only having to deal with the diagnosis, but also having to deal with the financial strain of losing the primary income,” she said. Ms Grogan, a member of the Young Adult Ministry at St Stephen’s Cathedral, said “faith has seen some of these clients get through rougher periods of time”. “I think with faith comes hope and strength and a connection to community in a different spiritual way,” she said. Ms Grogan said some clients had seen friends just “blank them” after they’ had been diagnosed with dementia. “The carer can lose touch with friends because of their caring role, and the person with dementia finds that people often look past them, not acknowledging them, but talking to their carers,” she said. Ms Grogan said she’d like to see some of her clients with dementia actively involved in the Memory Cafe – serving coffee and preparing food to help them develop a purposeful role in the community. “Just to let them say ‘Look. I am still able, I’m still willing, and I still can contribute’,” she said.